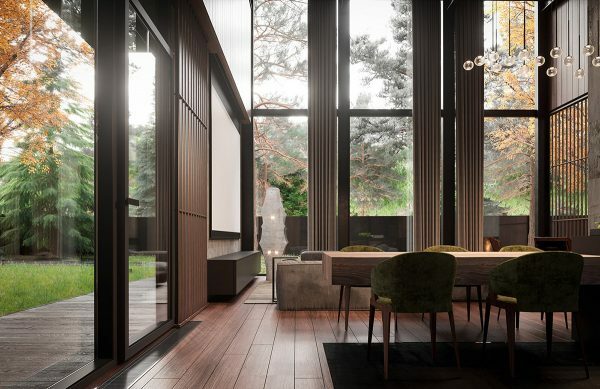 A rich and exquisite interior awaits us inside this modern rustic luxury home tour, visualised by Buro511. 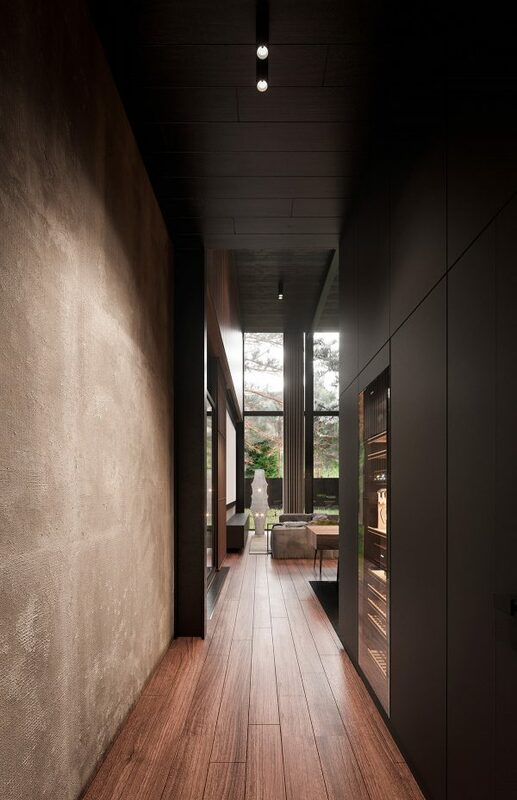 Dark wood tone covers the walls of a massive open plan living space, coupled with a raw concrete fireplace towering to the rafters. 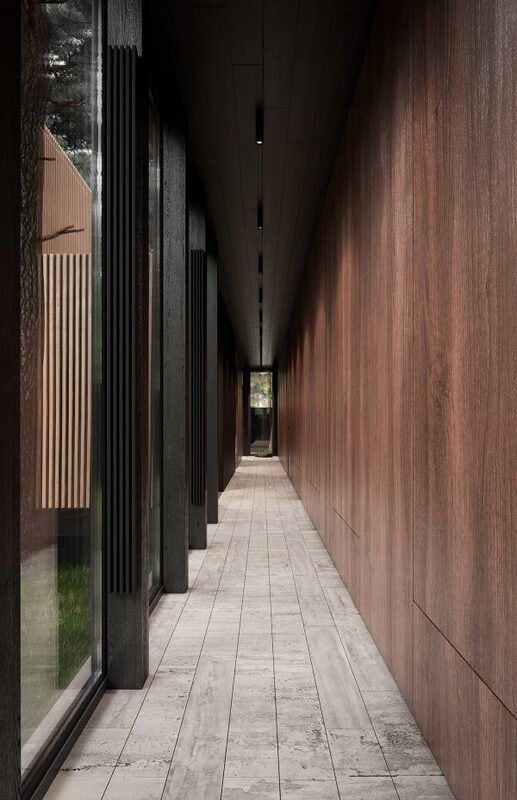 Clerestory windows and double height panes create high views up into the trees that grow around the grounds of the home, and which provide inspiration for the natural palette used within. Sumptuous furnishings make the home a welcoming and seductive place that one might never wish to leave. 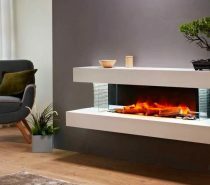 A roaring open fireplace and beautiful modern lighting schemes glow in the deep decor scheme, highlighting rough textures and throwing sheen over smooth finishes. 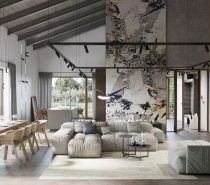 The open plan living room towers at twice an average room height, yet the depth of colour, boldness of furniture scale and the sumptuous fabrics make the room feel fully utilised and lived in. 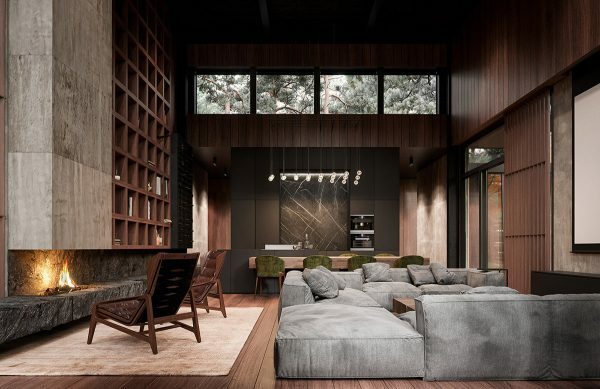 The rustic living room colour palette has been drawn from the mature trees growing on the surrounding land. 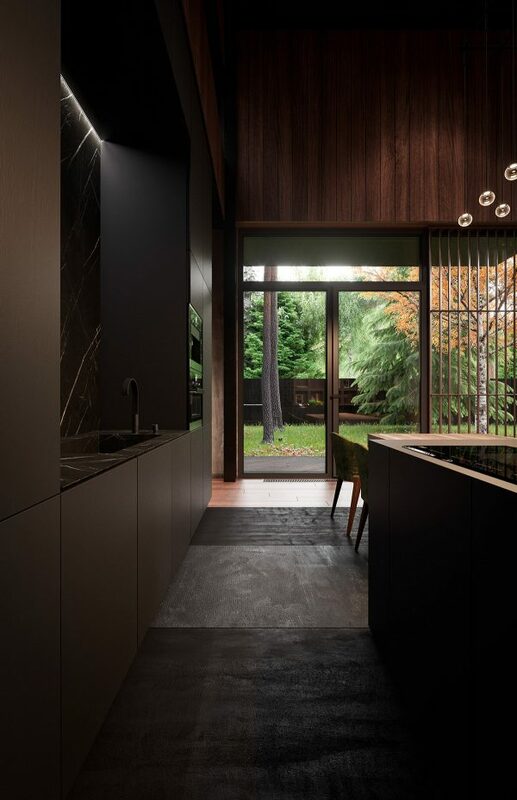 Their branches can be seen peeping through clerestory windows over the kitchen diner installation, where green dining chairs match their emerald leaves. 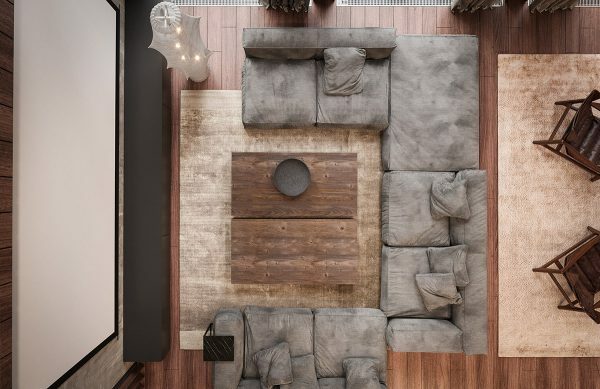 A stone grey sectional sofa creates a three sided cosy lounge space. 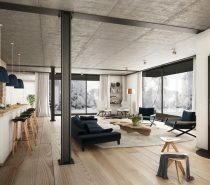 The sofas are bathed in natural light form enormous dual height windows that look out to the gardens. Massive curtain lengths pool at the floor. 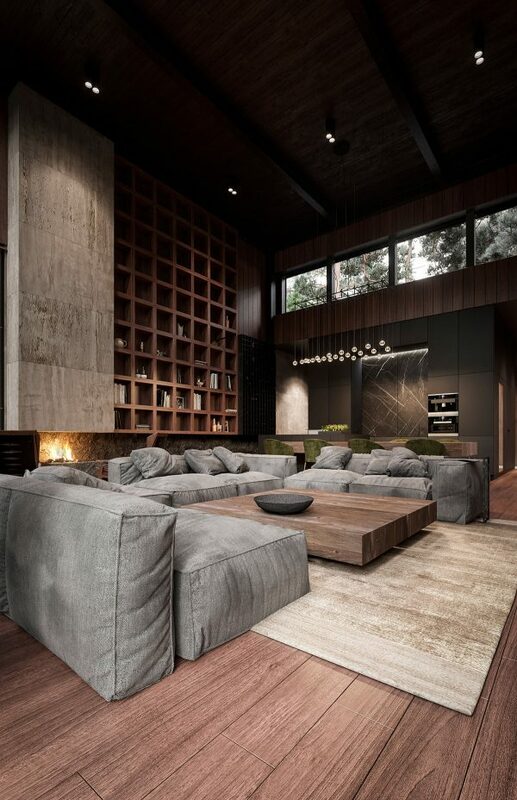 Rustic wooden coffee tables serve the centre of the lounge area. 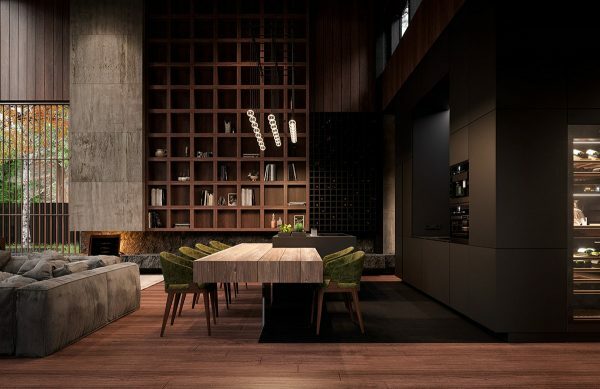 The green luxury dining chairs line up along two sides of a chunky wood slab dining table that is combined with the kitchen island. More luscious green garden views colour the dining area. 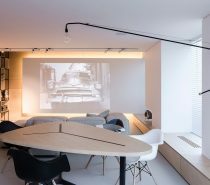 A huge wall mounted wine rack pushes up alongside an enormous bespoke shelving installation, which stores a modest library of books and small keepsakes. 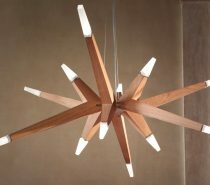 Dining pendant lights hang like jewels over the eating area. Small herb planters punctuate the end of the kitchen island before it descends into the lower level dining room table. 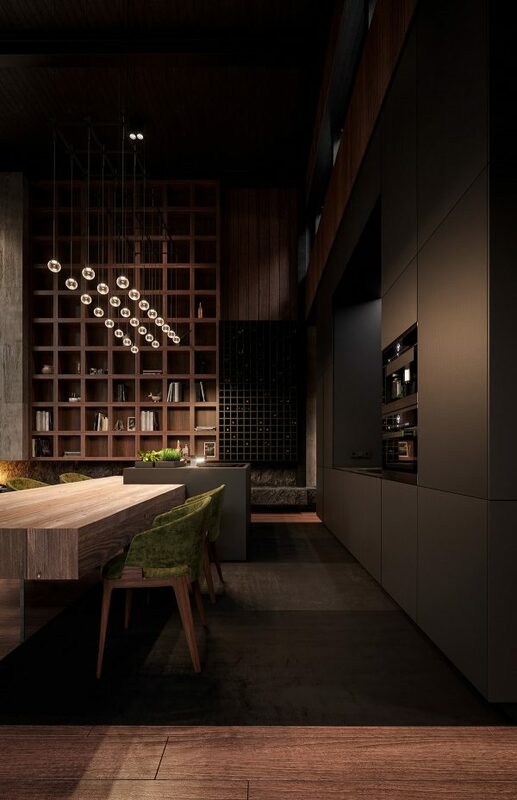 The herbs provide a flash of green accent colour that ties the kitchen prep island to the dining set. 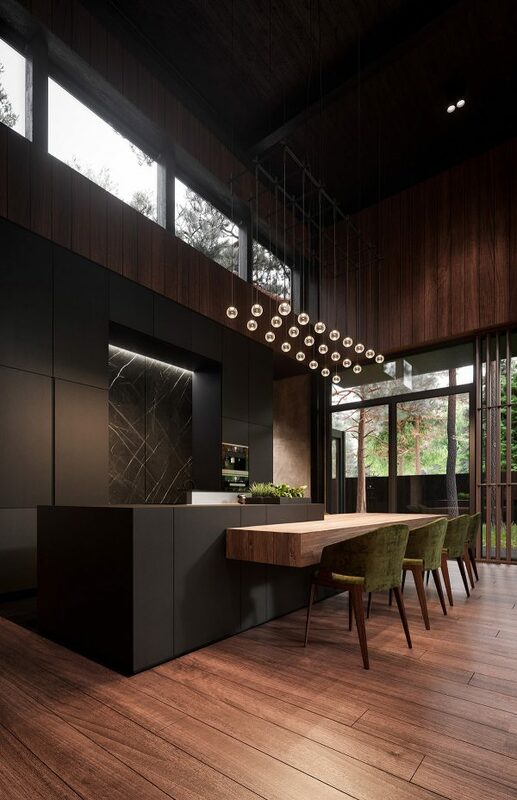 The flooring changes from a rich red hued wood stain to a dramatic black treatment in the kitchen area. 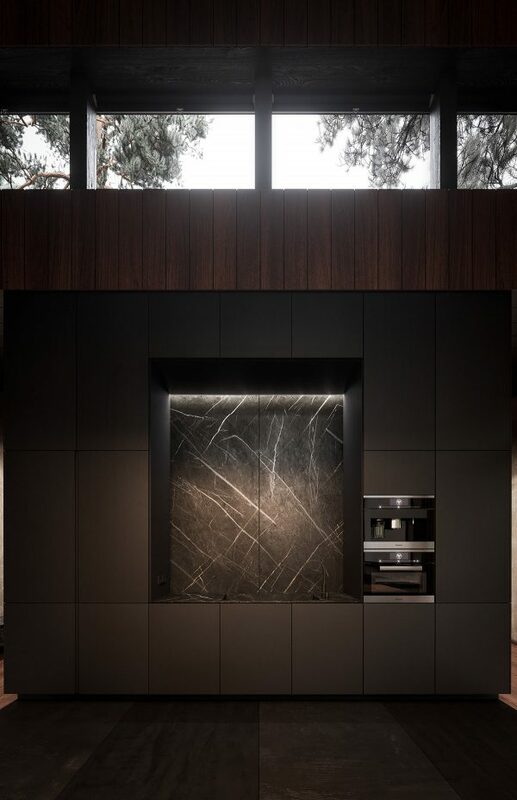 One wall of black kitchen cabinets line the back wall of the room, with a black backsplash and matching countertop at their centre. Further kitchen cabinet space is hidden around the corner. 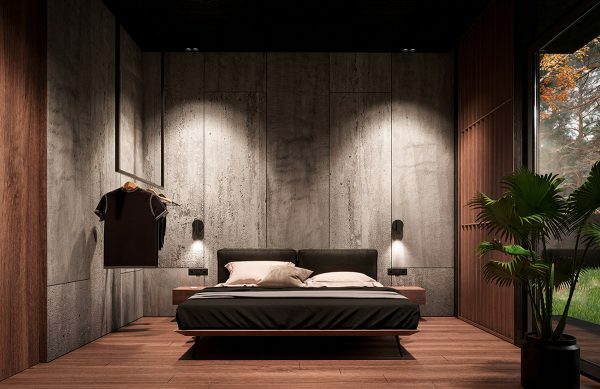 RIch wood tone and textured concrete reappear in the luxury bedroom decor, where moody lighting adds drama to the look. 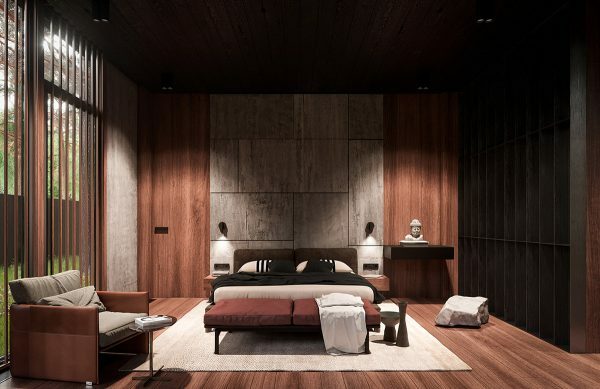 Two modern wall sconces shine down over wooden bedside units. 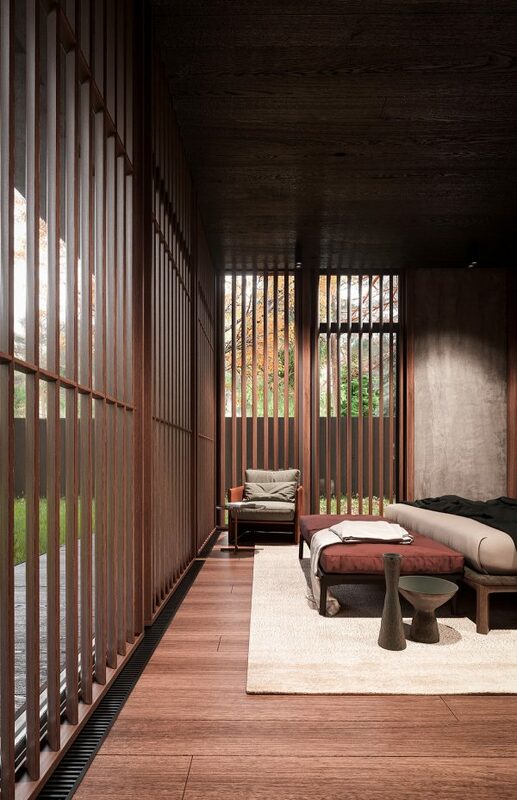 A second luxury bedroom is partially shielded from a garden during daylight hours by a wood slat wall design in front of the glass. 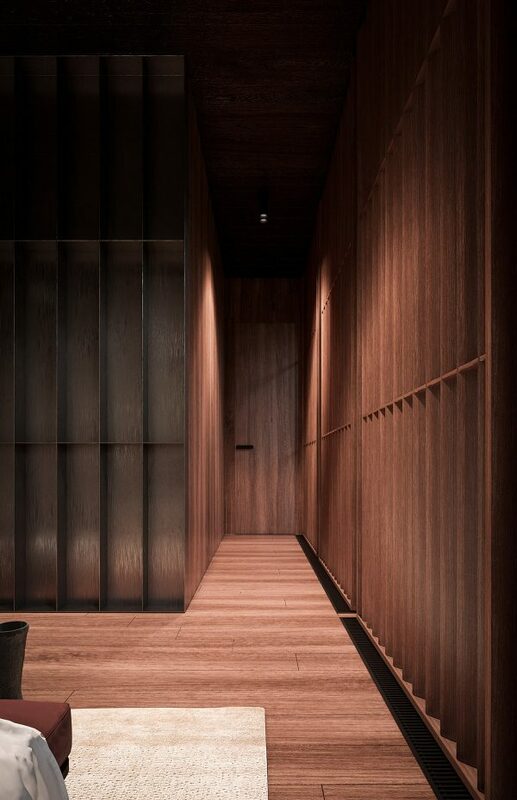 The slats stretch the entire height of the lofty room height. 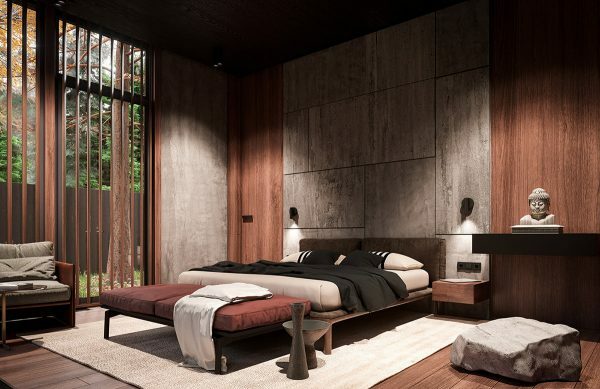 Concrete panels provide texture across the headboard wall. 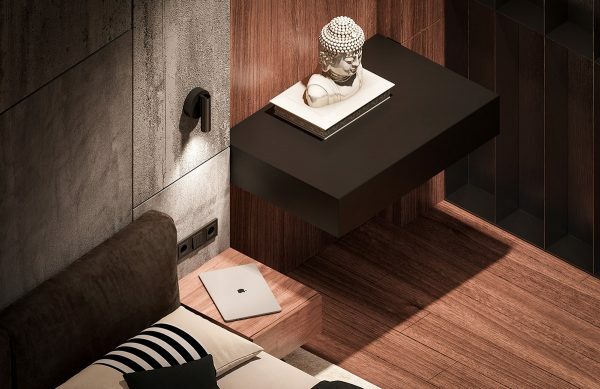 A buddha statue brings a zen feel to the room. 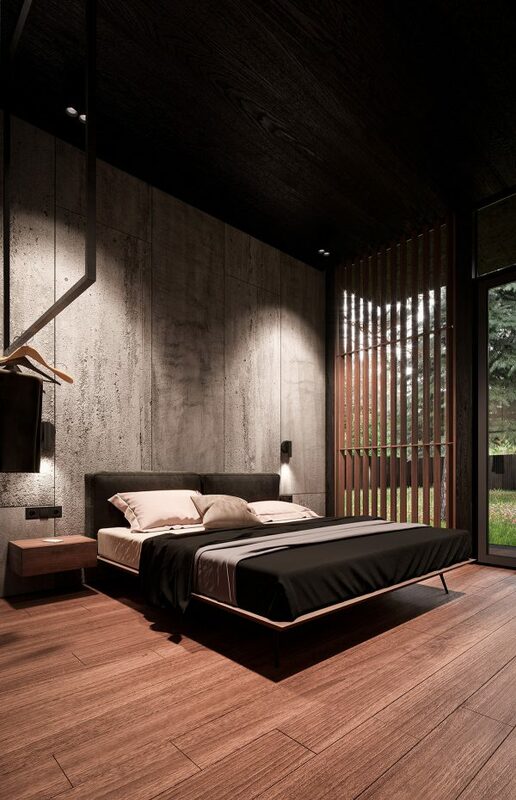 Wood slats shade the light from the windows around the foot of the bed. 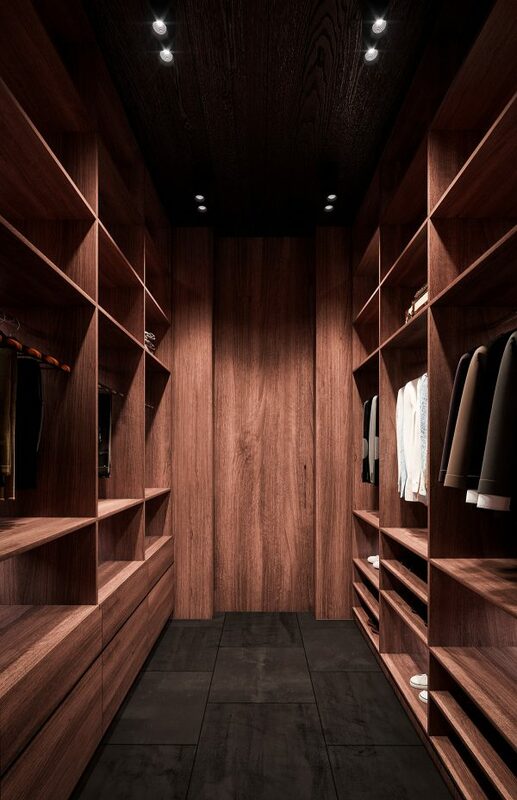 Red wood tone brings heat to each space, including a corridor toward the walk-in closet. 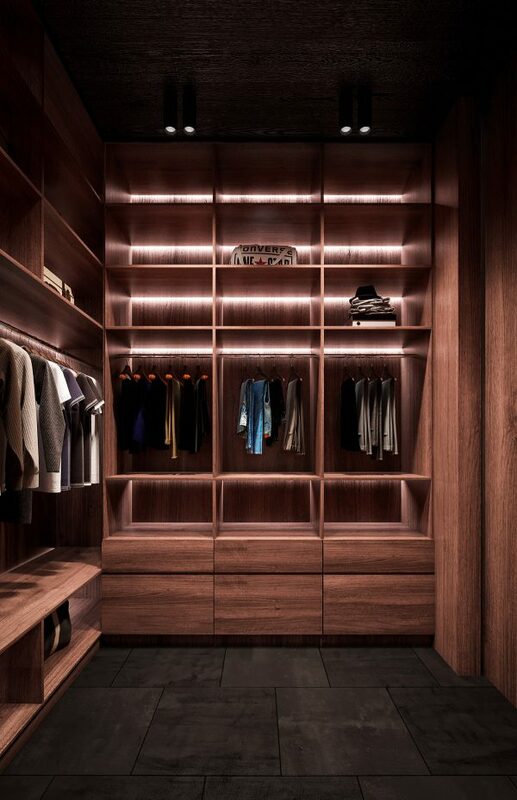 Inside the walk-in wardrobe, bespoke garment shelves and rails have been fitted in the same red tone wood effect. 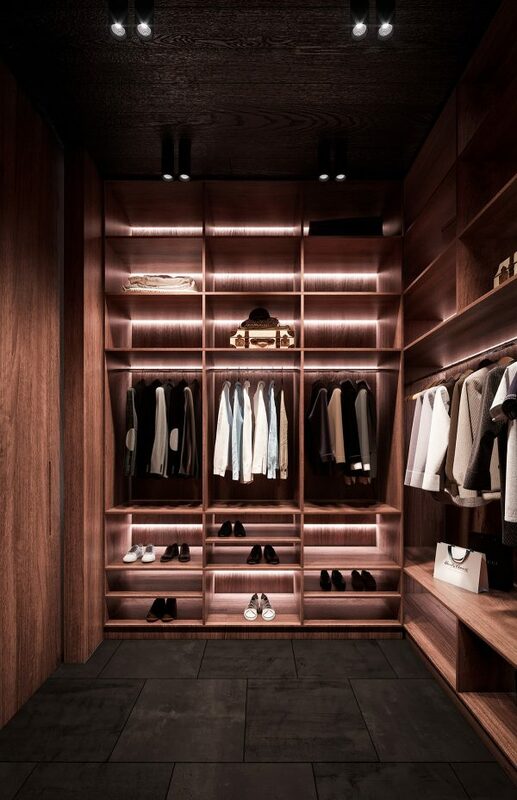 LED strip lights illuminate the made-to-measure closet system. The full vertical proportion of the space has been utilised, with high shelves providing a perfect for storage opportunity for extra bed sheets, seldom used special occasion items or out of season garments. 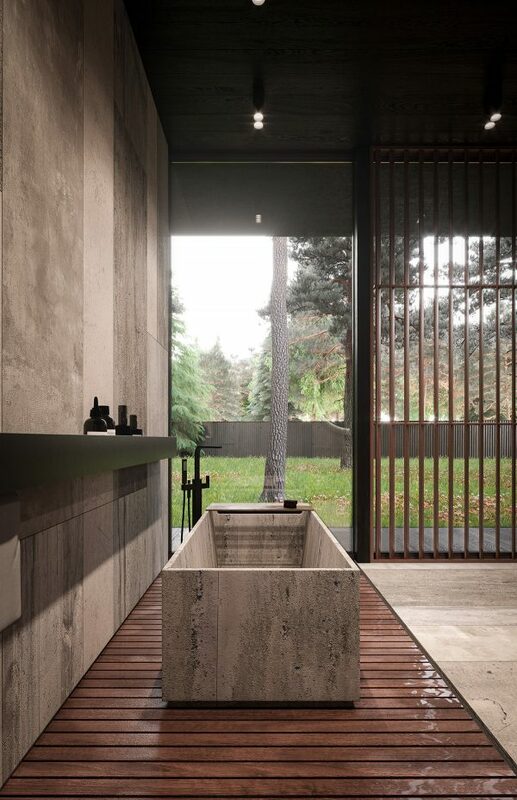 This luxury bathroom is home to a concrete bathtub and a matching concrete vanity unit. 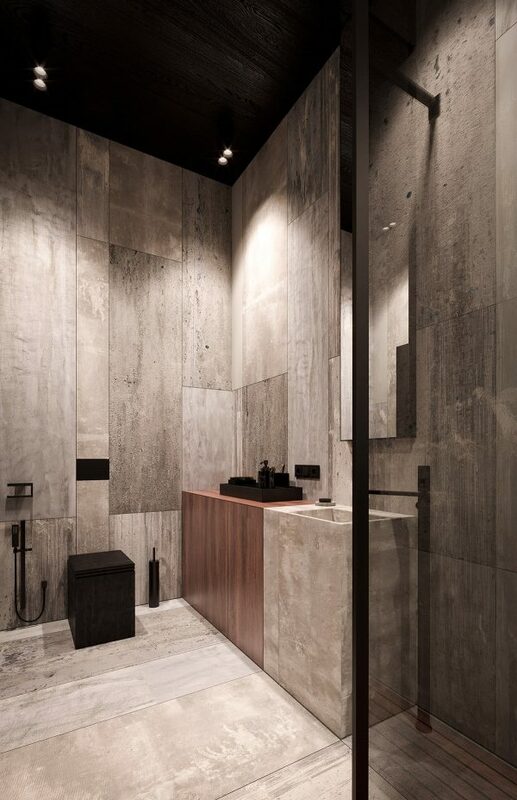 Concrete flooring stops at the wet zone, where wood slat flooring takes over beneath the tub and the shower enclosure. 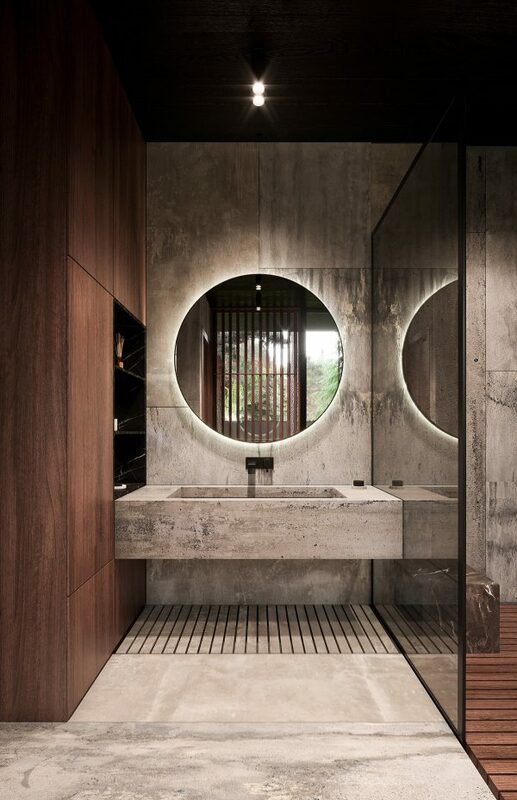 A large illuminated vanity mirror brightens up the sink area. 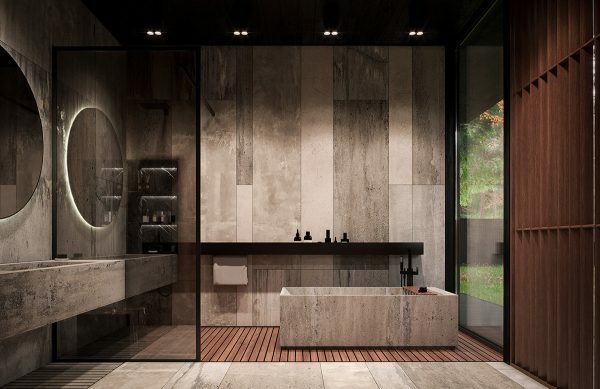 The bath even has a garden view. 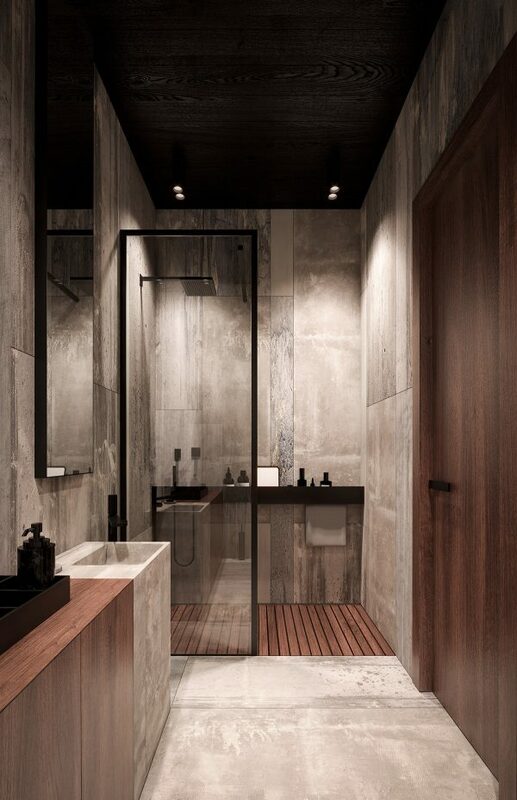 You can find more beautiful bathrooms with bathtubs here. 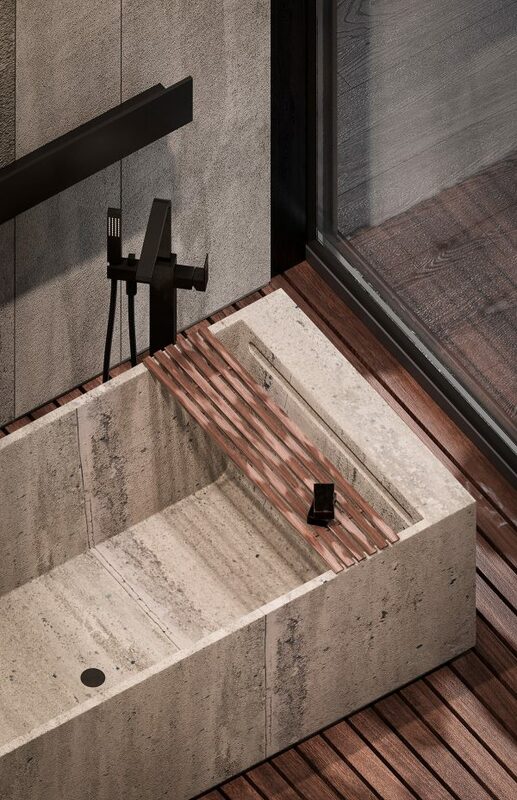 A wooden bath shelf provides a place to perch toiletries or a good magazine. 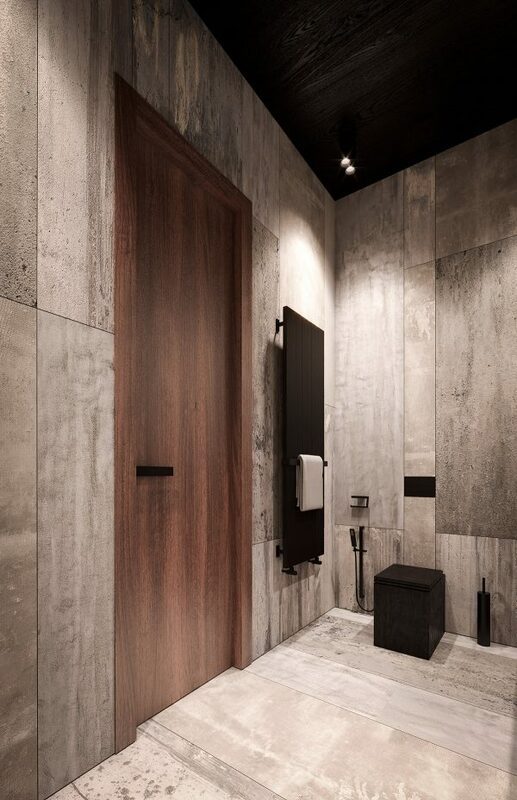 The black square toilet is matched by a twin bidet. 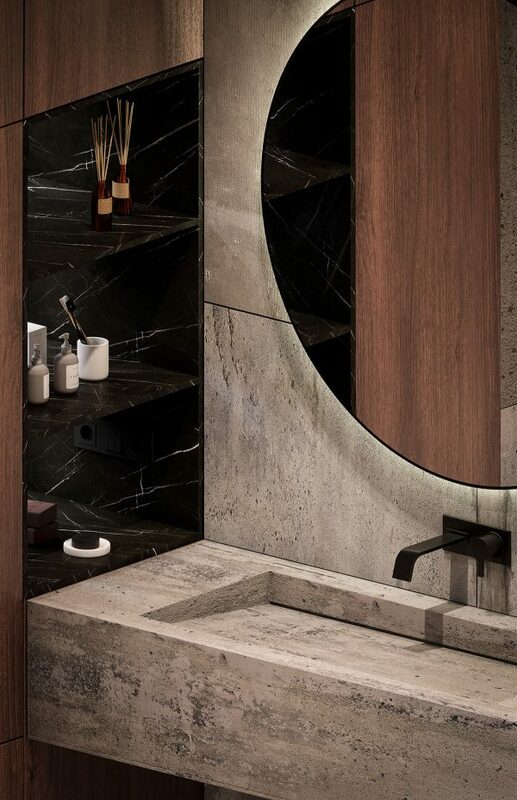 Shelves by the basin hold soap dispensers and all the essentials. Closet space is not traditional in the guest room, instead a ceiling mounted hanging rail holds garments neat and tidy. An indoor plant brings the garden to the inside of the glass. 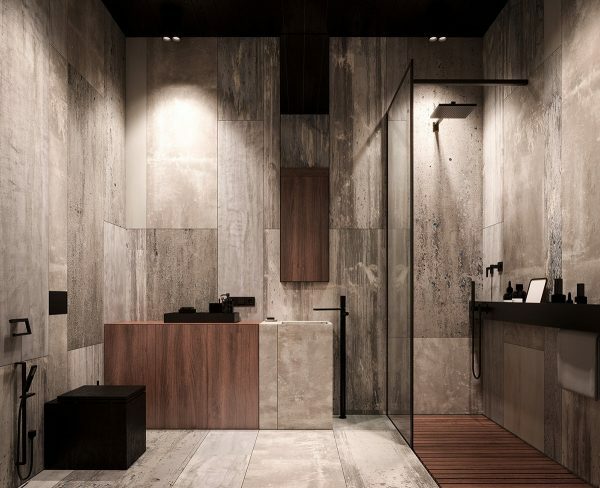 The luxury shower room follows the wood and concrete trend found in the previous bathroom, though this time with a much smaller concrete vanity and no separate bidet or bathtub present. 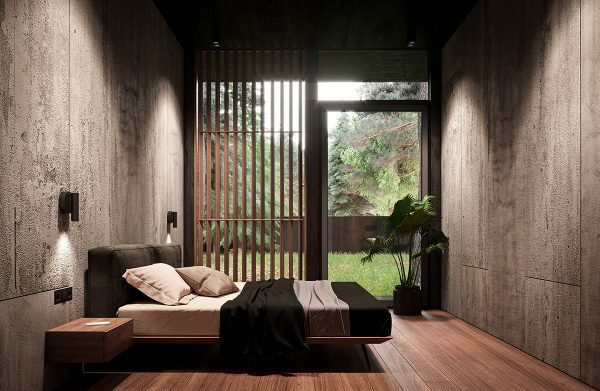 A black towel heater fills one wall by the door. 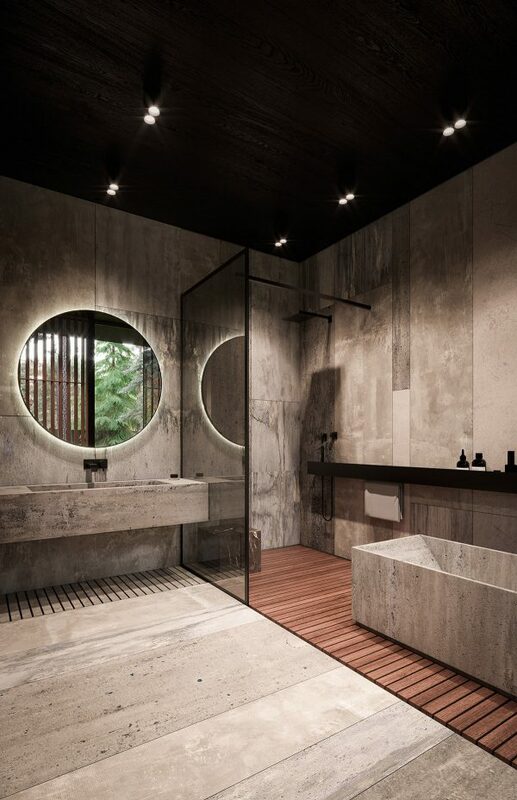 Inside the shower enclosure, a shallow black shelf holds all the usual lotions and potions close at hand. 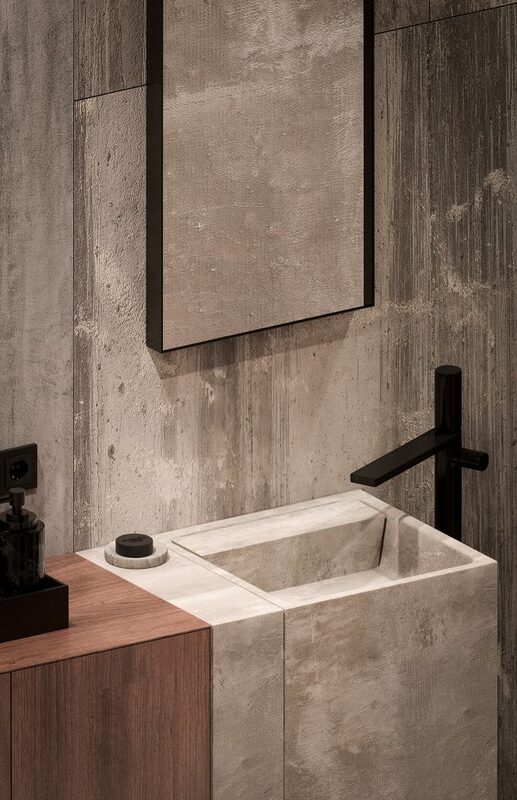 The unique bathroom sink has been teamed with a black faucet. 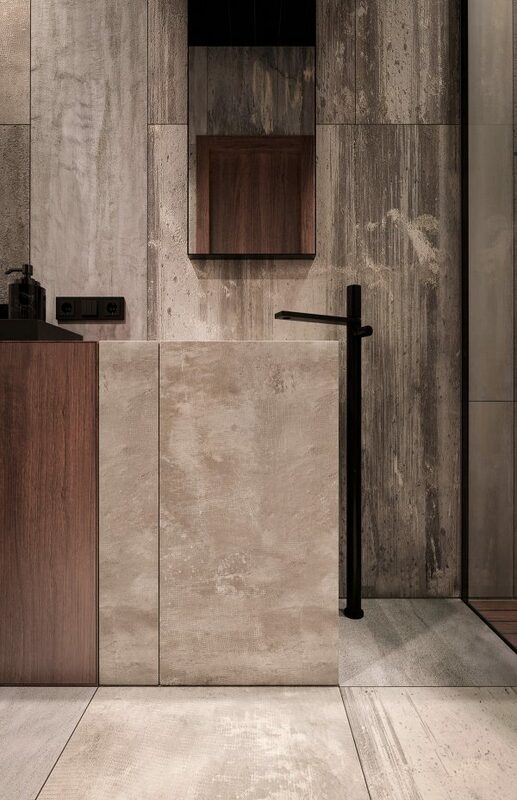 The faucet is a freestanding design, which creates a hyped look of luxury and unique style. 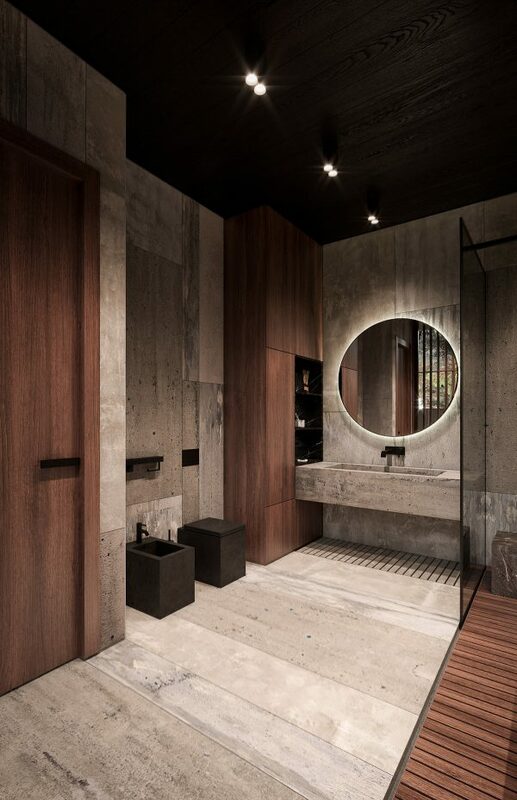 Black bathroom accessories and a back flush plate above the black toilet all match with the freestanding basin tap. Concrete planks floor the hallway to the bedrooms and bathrooms. 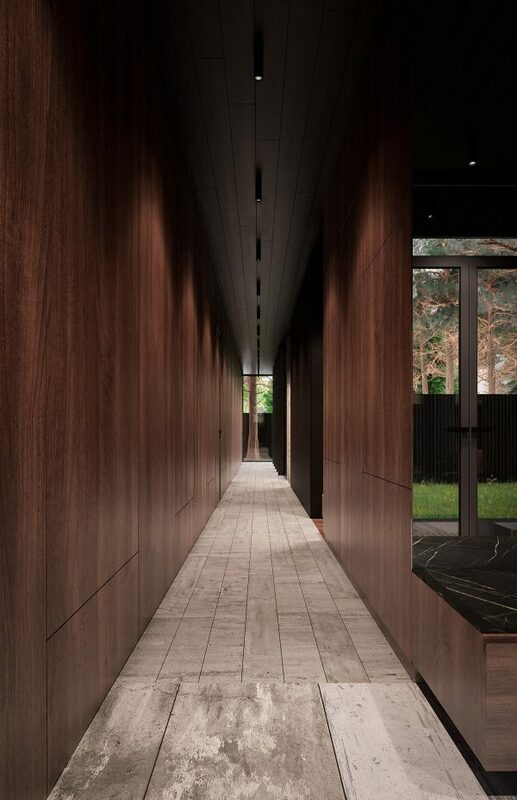 Rich wood effect panels cover all the walls between the windows. Through the window glass, pops of green enter the decor from the garden. 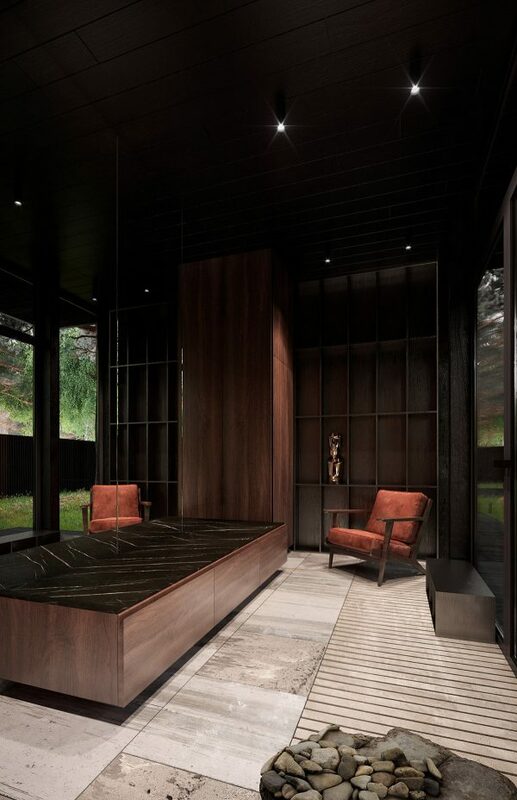 A small sitting area resides at the entryway, where mirrored glass panels reflect the garden scene through the doors opposite. 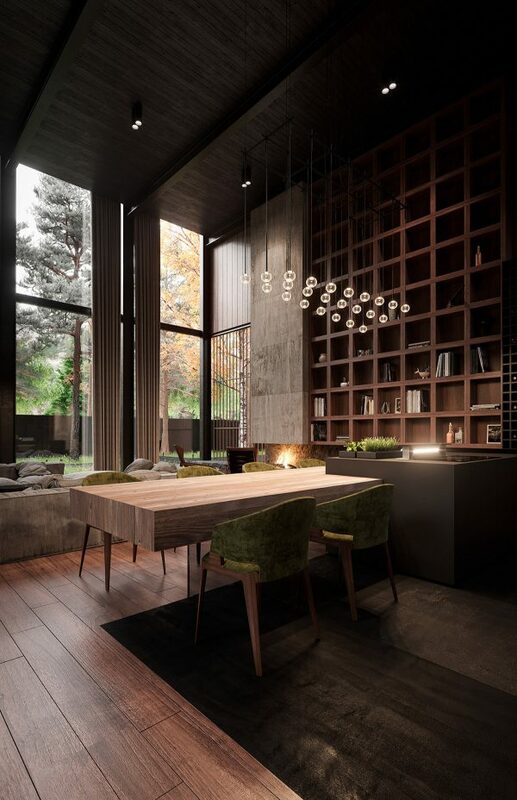 A black finish works to visually lower the ceiling height here, making the space feel more compact and cosy. Wooden storage drawers hide beneath a seat topped with streaked stone. A red accent chair complements the tone of the wooden furniture and display shelves.